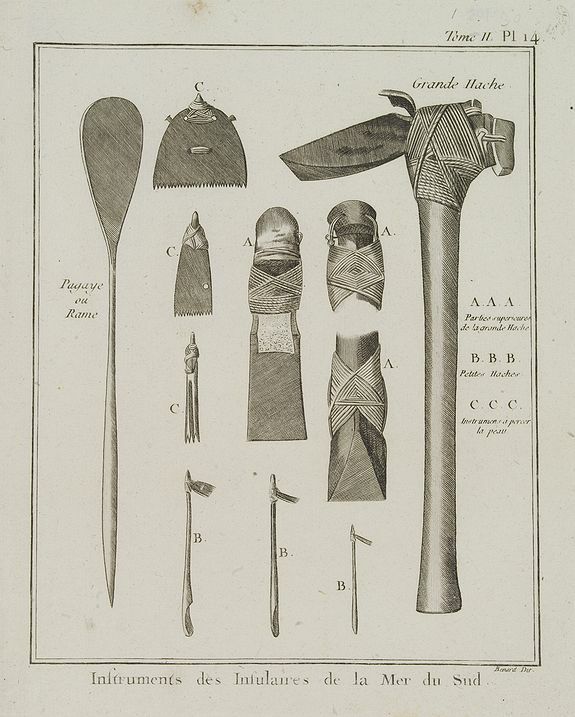 Instruments des Insulaires de la Mer du Sud. [Tome II Pl. 14.] - COOK, Captain James. Title : Instruments des Insulaires de la Mer du Sud. [Tome II Pl. 14.]. Map maker : COOK, Captain James.. Size : 7.9 x 13.8 inches. / 20.0 x 35.0 cm. Description :Various tools. From the French edition of James Cook's first voyage entitled Relation des voyages entrepris par ordre de sa Majesté Britannique actuellement régnante pour faire des découvertes dans l'hémisphère méridional, et successivement exécutés par le commodore Byron, le capitaine Carteret, le capitaine Wallis et le capitaine Cook dans les vaisseaux "le Dauphin ", "le Swallow" and "l'Endeavour". Engraved by Robert Benard, a very talented engraver, particularly of natural history subjects after his own designs and those of others, such as Redouté. His attention to detail give a very clear indication of the subject that is at its best, almost photographic. Translated by Suard and published in Paris by Saillant et Nyon - Pancoucke in 4 volumes with numerous illustrations, charts, and maps. An Account of the voyages undertaken by the order of His Present Majesty for making discoveries in the southern hemisphere, and successively performed by Commodore Byron, Captain Wallis, Captain Carteret and Captain Cook, in the Dolphin, the Swallow, and the Endeavour , the first official three-volume account of James Cook's first voyage, was edited by John Hawkesworth in English in London in 1773. The second and third volumes are entirely concerned with Cook's voyage, based upon material drawn from journals kept by Cook and the papers of Joseph Banks. Hawkesworth composed his account in the first person of Cook and incorporated Banks's descriptions and observations as well as his own commentary, without ever distinguishing the different sources. Captain James Cook, explorer, cartographer and hydrographer went to command several notable voyages, the first was from 1768-1771. He was led to his commission by the direction of British overseas exploration in 1766 as commander of HM Bark Endeavour for the first of three Pacific voyages. Cook's journals were published upon his return, and he became something of a hero among the scientific community. Cook's 12 years sailing around the Pacific Ocean contributed much to European knowledge of the area. Condition : Engraving. Very good condition.